Heh Grumm, old rule. Never ask a question unless you already know the answer. Well Mal's Effie made it against the odds, we got to Orroroo before we got the news. After a 7 month build from a clean sheet the only thing we had left was an FEA and we were ready to race. Bloody thing made more power on the pump than I expected and was on a very conservative tune up. We all share the disapointment. Its a cruel place but that makes any achievement there all the more special when it happens. I take my hat off to Bridgey, Savro and Mike for allowing me to create this project. We had lots of help and without help from Transfab at Logan Village and a multitude of others it would still be sitting in the shed.We tried to work by the 2012 rulebook so it won't take much to comply for next year. I'll get time now to post a few more build photos and look at what we have to do to be ready for next time. We had a whole lot of help from Ian Powell at Racetronics and Matt Cavill from Cavills performance in Shepparton. Last year, I believe , when the Colonel first fired the motor in the tank I said .."Hmmmmm, that sure turns hydrocarbons into sound a whole lot better than last years motor..."
Well, I'd heard the new motor on the dyno ...meh......when it fired up in the car it sounded mad, really mad ...yeah I know all you V8 blokes are going "yeah, yeah, whatever" but it sounded ferocious...I had the biggest idiotic grin on my face...the Colonel looks at me and says ...." I take it from the look on your face that your going to be trying to borrow a pair of bigger tyres yeah?" I think my eyes rolled back in my head a bit. Don't tell me Ian Powell is from Numurkah and thats like one street away from where I did my Apprenticeship at Terry Brennans Garage. Go Cart/Ian Powell. You don't even need to answer. The longer your in it the motorsport world the smaller it gets. Well if you can tune a go kart you can tune anything. If you fart the tune changes on a cart. How long can you hold your breath. Chris. We don't mention the word "Alloytech"
I said allotec not alloytech. Spend around 40G and they make 380hp after very much R@D and pain. I can talk about my previous life now. Quite an obscure thing. The worst noise that ever came out of that dyno room bar none. It did hurt your ears and had this point in the rev range that made you want to run for cover. V6's scare me. Inheriently unbalanced like their owners. Ask me what I really think. Greg yes I was privleged to train under Terry Brennan. He was a second generation mechanic cause the guy he did his time with (forgotten his name) had a certificate up on the wall and in 1976 he still worked. It said he qualified as "a Doctor of Motors" from the 1920's. He started in the horse'n'cart era. Very privilaged and I do owe Terry a beer. Also included is a road test!!!! Welcome to the forum Cannonball . It might help if ya get a bigger pointy'er ford badge for the grill . Err yes welcome to the alley...CB. Yes, the Effie is about as far opposite to the Ross Brawnliner as you could get. Pointy badge, your so funny Ross. As you can all see we are loaded for bear and waiting for March. Refer to my note on the Bilpa thread. Shes still underwater. Bugger Chris.. but hey, the yanks reckon the longer it takers to dry, the better the surface! Its occurred to me that Mals F Truck thread needs both a postscript and an update. Ran the truck in C/PP (that's 370ci/ production pickup for all you bike guys who don't get car classes ) the meeting before last. Went 184.985mph for the Aust. 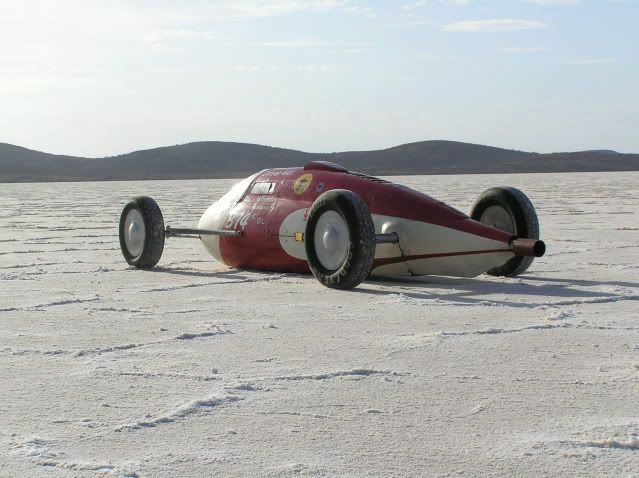 record ( on a 185.896mph Bonneville record held by Chock Full o' Nuts) Yes that's 0.911mph slower than our rival. Ouch. The thing cooked the oil and ran a bearing. I don't blame it. Driver error not keeping an extra eye on the oil temp gauge. We were a bit sad when we came home, tipped the contents of the bottom end in the Sims bin. Saved the CHI heads and perhaps the cam. Further post mortem found she was also frying a very expensive clutch. So slipping clutch then rolling through the timers we should have been kinda happy. Its expensive pushing a 2 story block of flats to 184mph. She took this year off and gathered dust in the shed. She's getting a bit toe'ie. Well after a recent meeting with Bridgee we have both committed to running the Effie again. The plan is fit the D size engine (301ci) out of our Purple AU ute Alvin and be ready for next year. Other mods include lowering the truck radically. From its original ride height it has already come down 6" but I figure with some major work we can drop another 4". The swap will also include the 5 speed Doug Nash, new tailshaft, some cage upgrades etc etc. I will endeavour to keep you posted but looking back at this diary I build better race cars than I do diaries. and all your cars seem to have little/no headroom? ?